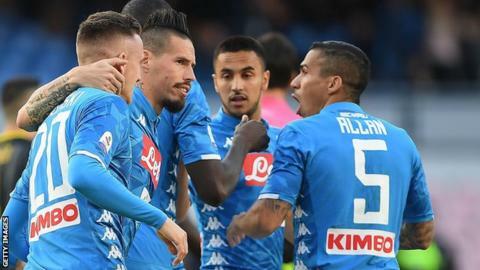 Napoli prepared for their decisive Champions League game at Liverpool on Tuesday with an impressive home victory over struggling Frosinone in Serie A.
Piotr Zielinski's low drive fired Carlo Ancelotti's side ahead before Algeria midfielder Adam Ounas scored with a stunning long-range strike. Poland striker Arkadiusz Milik headed in a third from a second-half corner and added his second from close range. Napoli are eight points behind Juventus, who beat Inter Milan. The Turin club, who have won the Italian title in each of the past seven seasons, defeated third-placed Inter 1-0 in the Derby d'Italia on Friday. Frosinone, who were promoted from Serie B last season, have won only once in 15 matches this term and are second bottom of the table, five points from safety. Match ends, Napoli 4, Frosinone 0. Second Half ends, Napoli 4, Frosinone 0. Attempt blocked. Amadou Diawara (Napoli) right footed shot from outside the box is blocked. Assisted by Allan. Attempt missed. Amadou Diawara (Napoli) right footed shot from the left side of the box is too high. Assisted by Faouzi Ghoulam. Joel Campbell (Frosinone) is shown the yellow card for a bad foul. Sebastiano Luperto (Napoli) wins a free kick in the defensive half. Foul by Joel Campbell (Frosinone). Attempt missed. Marko Rog (Napoli) right footed shot from outside the box is high and wide to the left. Attempt missed. Arkadiusz Milik (Napoli) left footed shot from the centre of the box is too high. Assisted by Amin Younes. Corner, Napoli. Conceded by Paolo Ghiglione. Attempt missed. Lorenzo Ariaudo (Frosinone) header from very close range is close, but misses to the right. Assisted by Danilo Soddimo with a cross following a corner. Corner, Frosinone. Conceded by Marko Rog. Attempt blocked. Danilo Soddimo (Frosinone) right footed shot from outside the box is blocked. Assisted by Francesco Cassata. Goal! Napoli 4, Frosinone 0. Arkadiusz Milik (Napoli) left footed shot from very close range to the bottom right corner. Assisted by Faouzi Ghoulam. Attempt missed. Camillo Ciano (Frosinone) left footed shot from more than 35 yards is close, but misses to the right from a direct free kick. Foul by Amadou Diawara (Napoli). Attempt blocked. Camillo Ciano (Frosinone) right footed shot from the centre of the box is blocked. Assisted by Andrea Beghetto with a cross. Joel Campbell (Frosinone) wins a free kick on the left wing. Substitution, Napoli. Amadou Diawara replaces Marek Hamsik. Attempt saved. Edoardo Goldaniga (Frosinone) header from the centre of the box is saved in the top centre of the goal. Assisted by Paolo Ghiglione with a cross. Corner, Frosinone. Conceded by Sebastiano Luperto. Substitution, Frosinone. Danilo Soddimo replaces Raffaele Maiello. Substitution, Napoli. Marko Rog replaces Lorenzo Insigne. Substitution, Napoli. Amin Younes replaces Adam Ounas. Attempt missed. Lorenzo Insigne (Napoli) right footed shot from outside the box is too high. Assisted by Faouzi Ghoulam with a cross following a corner. Corner, Napoli. Conceded by Marco Capuano. Substitution, Frosinone. Paolo Ghiglione replaces Francesco Zampano. Goal! Napoli 3, Frosinone 0. Arkadiusz Milik (Napoli) header from the right side of the six yard box to the high centre of the goal. Assisted by Faouzi Ghoulam with a cross following a corner. Corner, Napoli. Conceded by Marco Sportiello. Attempt saved. Adam Ounas (Napoli) left footed shot from outside the box is saved in the top right corner. Assisted by Elseid Hysaj. Attempt missed. Francesco Cassata (Frosinone) right footed shot from outside the box is high and wide to the right. Assisted by Camillo Ciano. Attempt missed. Lorenzo Insigne (Napoli) right footed shot from long range on the left is too high from a direct free kick.